Cast Iron Footed Pagoda Lantern sold as is. May have some slag in holes. 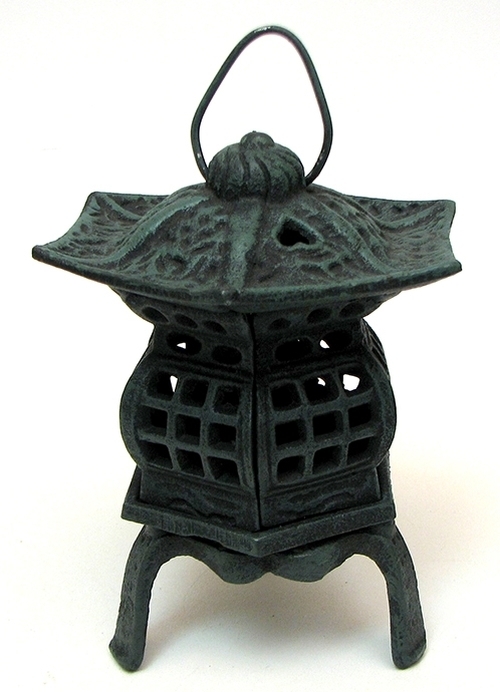 Cast iron features a traditional bronze patina.The hexagonal shape of this lantern and long three legs make it ideal for use as a free standing lantern. Use it in your garden, in your home or use two of them to mark the entrance to your sacred place. This lantern measures approximately 7" high x 5.5" wide x 4.75" deep, the hanger on the top adds almost an inch when extended, and will quickly become a favorite. It is best used with a candle for portability or can be adapted for electricity. This lantern features a screw in bottom for inserting votive candles.